A raw vegan cherry balm that is lush and hydrating. A deep red sheer tint and and black cherry flavour means this balm looks and tastes great. A lush and hydrating raw vegan cherry balm. A deep wildcrafted alkanet infusion gives this balm it's deep red tint while natural black cherry flavour makes it tart and yummy. The formula is smooth without being sticky. smelly or too glossy. It will hold up in a pocket all day without melting and is long lasting. Love Hurraw and this one is my favourite for a lovely natural tint. Looks like a really nice, smooth lipstick and smells amazing. My all-time favourite lip balm! I hate wearing lipstick so this tinted balm is my happy medium. I love this product. I also want to say that I ordered this on a Friday and it was in my mail box the following Monday. Fantastic service. I just love Hurraw and this one is my fave! My 3 daughters are also hooked. So nice to have a safe product that we use every day! Would definitely recommend this product. This is my favourite lip balm in the world... smells great, is the perfect shade of red without looking too over the top, and great for the environment. What's not to love!! Love this! Fab soft tint, texture and moisturising properties. This has a nice slight tint to it. I don't wear lipstick or coloured balms usually but this is nice if I'm going out and want a bit more colour. Just got this but on first try smooth and definite red tint. The smell and flavour are great. Love this lip balm! It makes my lips so soft and has the perfect slightly red tint. Really nice and light with a bit of a tint. This would have to be my most favourite lip balm brand and flavour, cherry how yummy smooth, it even has a slight cherry tint and a healthy choice in lip balms, my absolute fave! Nice. Smells likes kids cherry lip balm. Tastes like a kids lip balm too. Feels good on. Need to put lipstick on underneath if you want colour. It does what it advertises. Gorgeous lip balm - smooth, never sticky or lumpy and lasts for ages! Love it - the smell is amazing and the tint is subtle. Wish I bought more now! Love the cherry flavour and has a really nice red tint to make it look really pretty on. Great, deep colour. Very smooth and moisturising. Great product to add a bit of colour to your lips without all the nasties! Great lip balm. Feels lovely and gives a nice red tint. I love this lip balm so much. It's made my lips look and feel much better. There are many things I could rave about this product, the scent, the smoothness of the gloss or the perfect shade of red but what I really love is the package design! It is a perfect shape for applying to my lips and it fits in the front pocket of my jeans without making a little bulge. i will surely buy this product gain not only one but 100 pieces. Love it. Love all the Hurraw lip balms! Keeps lips hydrated without leaving that unpleasant greasy feel some other lip balms do. I bought this on a whim in my last order and had a full on allergic reaction to it (which I have never had to any product). My lips were scratchy and bumpy and I couldn't smile for a fortnight because it stretched the skin too much. DO NOT BUY. <EOL>Shop Naturally note: sorry to hear about this. You need to make a list of the ingredients and try to isolate what caused you the issue. We sell hundreds of these and you're the first customer we've heard of that has had a reaction. It's not totally uncommon for sensitive people to react to natural ingredients, so it's always safest to figure out what it was to avoid it in future. Just like the cherry chapsticks I loved as a young girl sans the nasties! Love this product and gives a nice light hint of colour too. Great lip balm nice tint very moisturizing, grown up sent and no taste! I love this lip balm. It makes my lips so soft and protects them from the wind! It's raw as well which is fantastic, and the cherry tint and flavour is delicious! Great flavour and natural tint on lips. Perfect for a natural subtle look. This lip balm smells yummy! Easy to apply, good handbag size, gives a slight 'cherry' tint to my lips and leaves them very soft & smooth. I've been using Hurraw! lip balm for years ~ It's wonderfully moisturizing, and the black cherry tint is a lovely transparent light red colour. Feels lovely when you put it on. Nice and soft. It smells lovely just like cherries. It is not sticky and it has a lovely suttle red tint. Great product. Out of all my Hurraw! lip balms, this one i like the best! The smell & the slight tint are highlights for me. i love this balm, lipstick looks so wrong on me - cheap and ageing - but this a subtle tint that I can get away with. Smooth and tasty plus I love the shape. This natural lip balm has a great cherry flavour and a subtle tint perfect for everyday wear. Finally a natural lip care without honey or any beeswax product. I bought this for my daughter and I will certainly be getting one for myself. The best vegan lip balm I have tried and I have tried a few! lovely texture, colour and smell. <EOL>great knowing there are no nasty chemical additives. Love this product. Natural and non toxic , smells greys and def great moisturiser. <EOL>As my young girls,become more interested in cosmetics, they can safely use this one with slight tints <EOL>Love it! Gorgeous, waxy texture makes your lips feel soft immediately. Lovely hint of cherry flavour and light lovely cherry tint. Love, love, love Black Cherry. It is a must in my vanity case and handbag! Great lip balm- it's moisturising, with a nice colour that doesn't just disappear when you put it on. The fact that it's vegan friendly was also a big selling point for me. Love this product. Feels fantastic on the lips and the Black Cherry colour is great. This is the best and only lip gloss brand I have used since I discovered them years ago. I love all the different flavours but the tinted cherry is certainly the best and gives me that hint of colour. Love this product! My lips always feel soft and beautifully tinted! Love this - would be good if this is available in a stronger colour too. This lip balm smells delicious and leaves lips feeling soft. I'm really picky about the lip balms I use but I have found this one to be effective and doesn't dry out my lips quickly like some other ones I've used before. I adore the colour and feel of this lip balm but unfortunately I reacted to it. Really disappointed about that since it looked great! 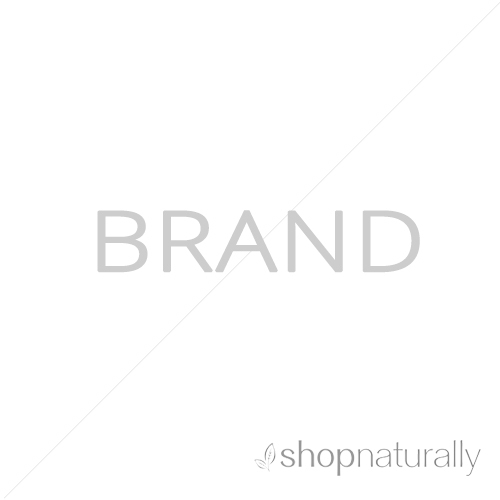 <EOL>Shop Naturally note: these are 100% natural and vegan. You should make a note of the ingredients and try to work out which one you're allergic to. It's not uncommon for people with sensitivities and health issues to react to healthy ingredients in skin care or food. Isolating them is a good idea. Love, love, love. I have all 4. A reasonably priced vegan lip balm that keeps my lips moist. I will be buying this one again. Love the hint of colour this provides me. Great lip balm with a nice subtle colour. 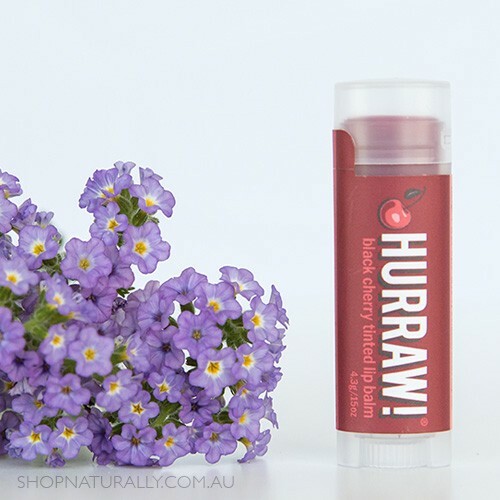 I love all varieties of the Raw Vegan Lip Balm, but Black Cherry is my favourite by far! It is SO good. Smells divine and is silky smooth to apply. It keeps lips soft and smooth. Perfect for summer with just a hint of colour. Really like this lip balm, great for sensitive lips like mine! Has a really nice cherry scent and a subtle red sheen! Love this lipbalm! Smells great, leaves just a good amount of red too make your lips look luscious during the day or night! Smells amazing, tastes amazing, lips feel amazing. Leaves just the hint of colour for a bit of a glow without looking like I'm wearing lippy. I have all of them. Totally love Hurraw!